DIY lip scrub – exfoliate and moisturize dry lips with this homemade Strawberry lemonade lip scrub. I’ve started using a DIY lip scrub to help exfoliate my dry lips that I seem to get every winter and early spring. It really seems help bring moisture back in! This easy homemade strawberry lemonade lip scrub smells amazing and helps lips feel silky smooth. 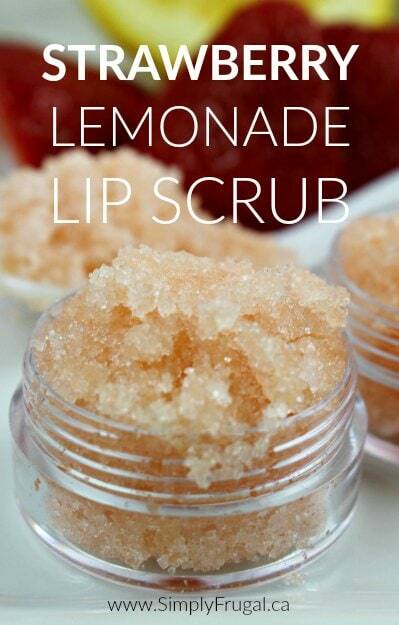 This lip scrub is made with almond oil, sugar, strawberry extract and lemon essential oil. The rough texture of the sugar will exfoliate your lips while the almond oil will help bring back moisture. The strawberry extract and lemon essential oil provide a refreshing and delicious scent. I’m including Amazon affiliate links below to where you can find each product used in this tutorial. In a small mixing bowl, add all of the ingredients. Mix until well blended. Transfer to airtight containers. 1. Apply to wet lips and exfoliate by rubbing finger against the scrub in a circular motion. 2. Rinse with warm water and pat dry with a towel. 3. Apply your favorite lip balm.